Then ... we next see them amongst a collection of makeshift sculptures alongside a freeway on the edge of the bay - the distant sign at far right gives us a first clue as to the location. 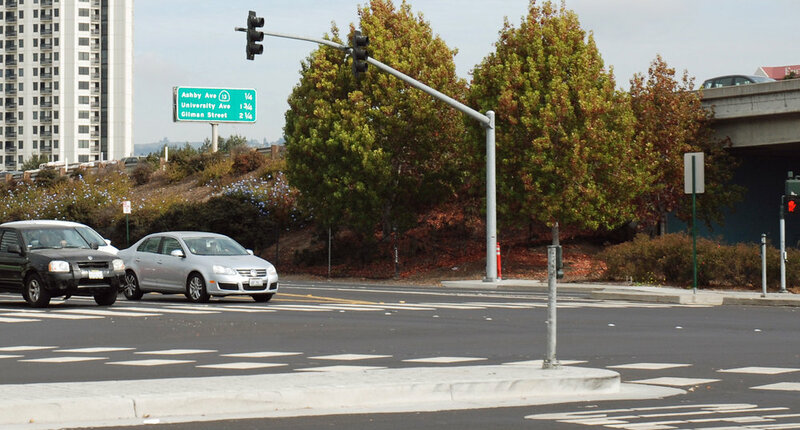 ... and Now, the scene was filmed on the east bay Emeryville mudflats alongside Highway 80 (map). Those office buildings and the Hilton hotel (formerly a Holiday Inn) have since been built on the Watergate Peninsula. ... and Now, it can't be seen now from the mudflats (blocked by trees), but the sign is still there, viewed here from Powell Street. By triangulation using this sign and a distant view seen in another shot CitySleuth was able to home in on the scene's location, immediately south of the Watergate Peninsula. The mudflats were a magnet for driftwood and industrial flotsam. 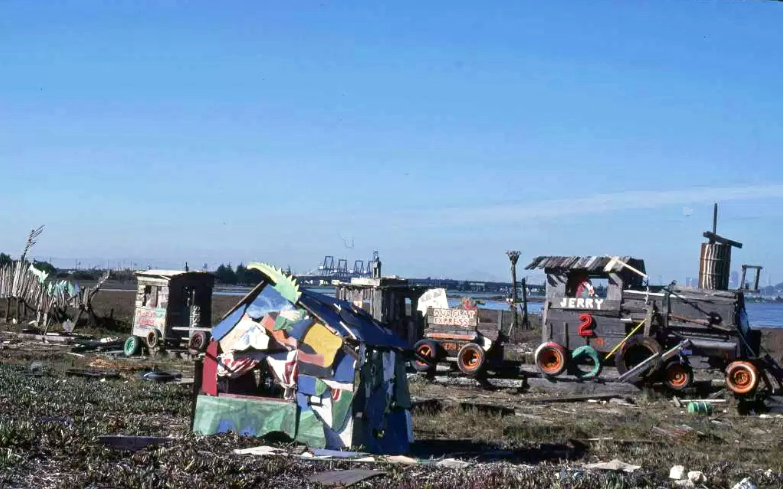 Anonymous artists began fashioning these found objects into sculptures around 1960 and continued off and on until 1985 when the area was designated a State Marine Reserve and cleaned up. Here's a c. 1980 photo of the sculpture garden with the partially constructed Watergate Peninsula complex in the background. For a sample of sculptures that appeared here over the years click or tap the image below. Getting back to the movie ... as Harold lovingly clasps Maude's hand he is jarred at the sight of an I.D. number tattooed on her arm, a peek into her past. Then ... but she pretends not to notice and, seeing a flock of seagulls against the golden sunset, tells him that the French Jewish political prisoner Alfred Dreyfus used to watch birds from his island prison, thinking of them as 'glorious birds' but disappointed years later to realize they were only seagulls. "For me", she says, "they will always be glorious birds". A symbol of freedom perhaps, for a Holocaust survivor? ... and Now, the view towards San Francisco spans, from left to right: Twin Peaks, downtown San Francisco, Treasure Island, Bay Bridge east tower, Golden Gate Bridge, the headlands and hills of Marin County and at far right the tip of the Watergate Peninsula; its parallax position against the Marin hills was the second clue to the scene's location. 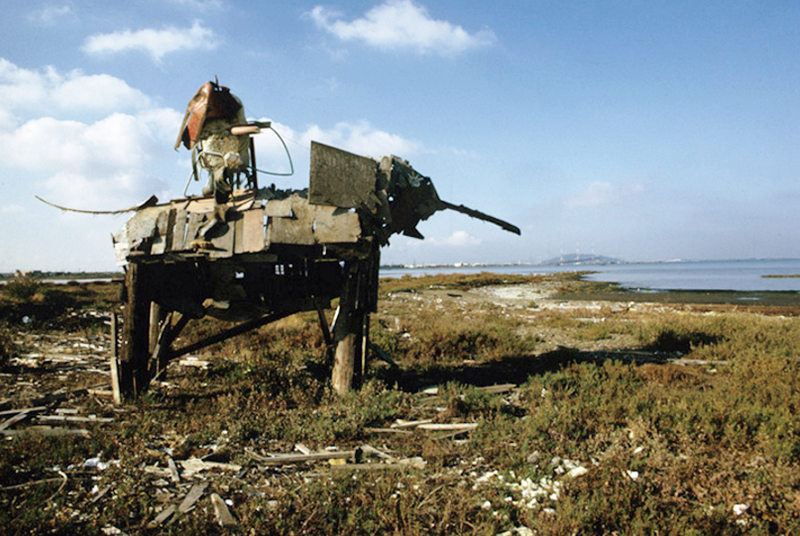 The mudflats didn't only host whimsical artworks; often there were social or political messages too, as for example this 'End War' sign in 1971 when Vietnam weighed heavily on the conscience of the nation. Harold and Maude was filmed in 1971 - it is quite possible that director Hal Ashby was inspired by the sign and planned on taking it a step further with a stronger message ... but the footage ended up on the cutting room floor; here's an outtake image.